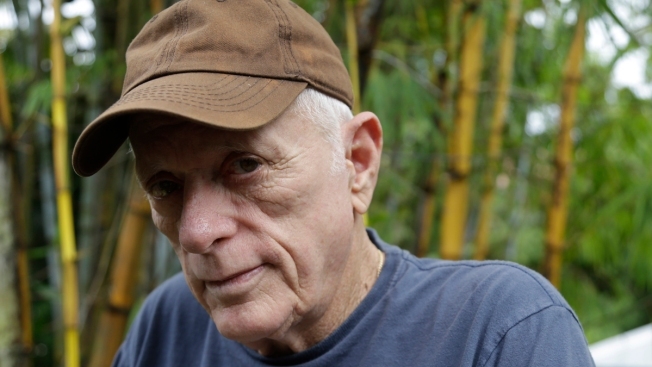 In this Thursday, Sept. 25, 2014 photo, Ric O'Barry poses for a photograph at his home in Miami. O'Barry went from being a Dolphin trainer on the beloved "Flipper" TV series in the 1960s to a notorious activist featured in the 2009 documentary "The Cove," which shows the killing of dolphins in Japan. Former "Flipper" trainer Ric O'Barry was arrested for not carrying his passport while in Japan to protest a dolphin hunt due to begin this week. Police in western Japan said they received a tip that O'Barry might be driving under the influence of alcohol. He passed a breath test but was detained after he could not produce his passport. The 75-year-old star of "The Cove," a 2009 Oscar-winning documentary about Taiji's dolphin hunt, was being detained in the town of Shingu on Tuesday after his arrest the previous night. Many dolphins are killed and some are captured for sale to aquariums during the western town's annual, six-month hunt. This year's was scheduled to start on Tuesday but postponed because of bad weather, according to Japan's Kyodo News service. O'Barry and other activists are unwelcome visitors to Taiji. Sea Shepherd Conservation Society USA said earlier that two of its members were refused entry to Japan on arrival. Lisa Agabian, a spokeswoman for Sea Shepherd, said by email that in past years the group's activists have been followed and harassed by the police. O'Barry was stopped while heading to his hotel from dinner at a restaurant, his son and fellow activist Lincoln O'Barry said by phone from Los Angeles. Japanese law requires that foreign visitors carry their passports or another acceptable form of ID. The elder O'Barry, an American who trained dolphins for the 1960s "Flipper" TV series, had a change of heart and now campaigns against both capturing and killing the animals.